HomeLink and HomeLink house are registered trademarks of Johnson Controls. The HomeLink system replaces up to 3 hand-held transmitters with a single builtin component in the auto-dimming mirror. Pressing the HomeLink button on the auto-dimming mirror activates garage doors, gates and other devices surrounding your home. Using these garage door openers can increase the risk of serious injury or death. For further information, contact HomeLink at 1-800-355-3515 or www.homelink.com or your Authorized Mazda Dealer. Programming or operating the HomeLink system without verifying the safety of areas surrounding garage doors and gates is dangerous and could result in an unexpected accident and serious injury if someone were to be hit. The programming will not be erased even if the battery is disconnected. It is recommended that a new battery be placed in the hand-held transmitter of the device being programmed to HomeLink for quicker training and accurate transmission of the radio-frequency signal. • Verify that there is a remote control transmitter available for the device you would like to program. • Disconnect the power to the device. When programming a garage door opener or a gate, disconnect the power to these devices before performing programming, as continuous operation of the devices could damage the motor. 1. Position the end of your hand-held transmitter 2.5―7.5 cm (1―3 inches) away from the HomeLink button you wish to program while keeping the indicator light in view. 2. Simultaneously press and hold both the chosen HomeLink and hand-held transmitter buttons. Do not release the buttons until step 3 has been completed. Some gate operators and garage door openers may require you to replace this Programming Step 2 with procedures noted in the “Gate Operator/Canadian Programming” section. 3. After the HomeLink indicator light changes from a slow to a rapidly blinking light, release both the HomeLink and hand-held transmitter buttons. If the HomeLink indicator light does not change to a rapidly blinking light, contact HomeLink at www.homelink.com or call 1- 800-355-3515 for assistance. 4. Firmly press and hold the programmed HomeLink button for five seconds, and then release it. Perform this operation two times to activate the door. If the door does not activate, press and hold the just-trained HomeLink button and observe the indicator light. If the indicator light stays on constantly, programming is complete and your device should activate when the HomeLink button is pressed and released. To program the remaining two HomeLink buttons, begin with “Programming”― step 1. If the indicator light blinks rapidly for two seconds and then turns to a constant light, continue with “Programming” steps 5―7 to complete the programming of a rolling code equipped device (most commonly a garage door opener). 5. At the garage door opener receiver (motor-head unit) in the garage, locate the “learn” or “smart” button. This can usually be found where the hanging antenna wire is attached to the motorhead unit. There are 30 seconds in which to initiate step 7. 7. Return to the vehicle and firmly press, hold for two seconds and release the programmed HomeLink button. Repeat the “press/hold/release” sequence a second time, and, depending on the brand of the garage door opener (or other rolling code equipped device), repeat this sequence a third time to complete the programming process. HomeLink should now activate your rolling code equipped device. For questions or comments, please contact HomeLink at www.homelink.com or 1- 800-355-3515. Canadian radio-frequency laws require transmitter signals to “time-out” (or quit) after several seconds of transmission ― which may not be long enough for HomeLink to pick up the signal during programming. Similar to this Canadian law, some U.S. gate operators are designed to “time-out” in the same manner. If programming a garage door opener or gate operator, it is advised to unplug the device during the “cycling” process to prevent possible overheating. Continue to press and hold the HomeLink button while you press and release― every two seconds (“cycle”) your handheld transmitter until the frequency signal has successfully been accepted by HomeLink. (The indicator light will flash slowly and then rapidly.) Proceed with “Programming” step 3 to complete. Press the programmed HomeLink button to operate a programmed device. The code will continue being transmitted for a maximum of 20 seconds. 2. The indicator light will begin to flash after 20 seconds. Without releasing the HomeLink button, proceed with “Programming” - step 1.
) 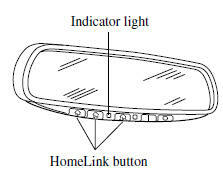 on the auto-dimming mirror until the HomeLink indicator light begins to flash after approximately 10 seconds. Verify that the programming has been erased when you resell the vehicle.